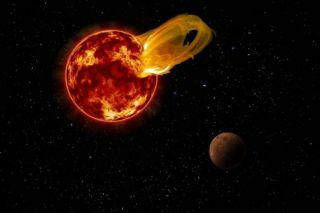 Artist's illustration of a powerful flare erupting from the red dwarf star Proxima Centauri. The nearest exoplanet to Earth may get hit hard by damaging ultraviolet radiation, making it tough for life to survive there, a new study suggests. That planet, the roughly Earth-mass Proxima b, circles the small, dim star Proxima Centauri, which lies just 4.2 light-years from Earth. And Proxima b orbits in its host's star "habitable zone" — the just-right range of distances where liquid water could theoretically exist on a world's surface. The outburst was 10 times more energetic than any previously observed Proxima Centauri flare, and it briefly boosted the star's brightness by a factor of 68, study team members said. In the flare's immediate aftermath, observers under dark skies would have been able to see the star with the naked eye, which is pretty much unheard of for "red dwarfs" such as Proxima Centauri. The Evryscope also spotted 23 less-powerful Proxima Centauri flares over the past two years, according to the study. Based on these observations, the researchers calculated that the red dwarf probably blasts out superflares at least five times per year. The new results further bolster a growing sense among astronomers and astrobiologists that radiation could pose a major hurdle to the establishment and evolution of life on Proxima b and other planets circling red dwarfs (which are also known as M dwarfs). Previous studies, for example, have suggested that flares might completely strip away the atmospheres of such worlds over time, leaving their surfaces bare and exposed. Such dangers aren't as high for possibly habitable worlds around sun-like stars, which tend not to be so active. Also, because sun-like stars are hotter than red dwarfs, their habitable zones are farther away — meaning potentially life-supporting worlds don't get hammered as hard by stellar eruptions. Still, we shouldn't write off red-dwarf systems as possible abodes of life, said Ward Howard, the lead author of the new study. He cited the lack of detailed knowledge about such planetary systems, as well as the toughness and tenacity of "extremophile" organisms here on Earth, which have surprised researchers time and again. Researchers "should be careful not to go beyond what we can actually compute and study and measure and observe right now," Howard, a graduate student at the University of North Carolina, told Space.com. "I don't think we can say that there is not life around M-dwarf stars, given the current state of the field."